2009 already. Wow! How did that happen? The 2008 holiday season kept me busy every single minute right up to - and past - Christmas. Friends tell me that my feeling of being squeezed between Thanksgiving and Christmas happened because Thanksgiving was so late. Perhaps. My father's birthday also fell on Thanksgiving this year, so between November 27th and January 2, my family celebrated three birthdays, an anniversary, and three major holidays. That will put pressure on anyone. More than that, I made two significant Christmas gifts this year: a tee-shirt quilt for my youngest daughter and hand-marbleized quilting fabric for my mother. Disclaimer: I marbleized the fabric, I did not make the fabric. 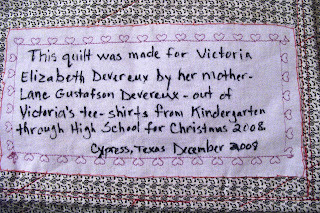 I constructed Victoria's quilt from tee-shirts of hers that go all the way back to kindergarten. Since she is now a senior in high school, that is q long time and a lot of tees. I made the process up as I went along, with coaching from my sister-in-law Judi that helped me avoid some big mistakes. Working with tee-shirts presents unique problems. They are knit and soft and slippery, especially old, well-worn tees, and you cannot really cut them uniformly, a must in quilting. So the cutting step got extended. First I reduced the tee-shirts to separate fronts and backs with no sleeves, collars, or seams. 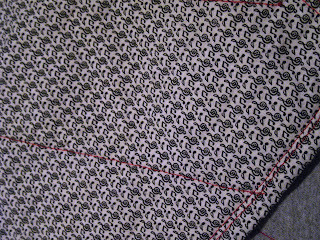 Next, I ironed fusible interfacing onto each piece. Then I recut all the pieces to square, so they would sew up together properly. 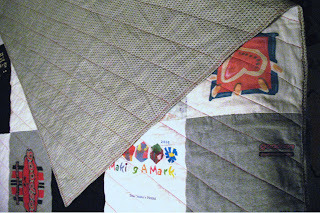 The top and bottom of the quilt sandwich around batting, the stuff that makes a quilt warm and soft. I do not care for the basting or pinning that one must do to hold a quilt together for finishing, so I tried something new this time - a fusible batting. It turned out to be fine, but I inadvertently purchased crib-sized batting, so I had to piece two of them together in order to make Victoria's quilt. Then I had to crawl around on my tile floor, ironing and steaming the entire quilt to fuse it together. A tedious process at best, but I did it. 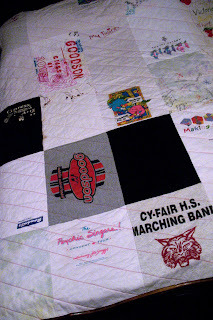 All-in-all, making this quilt is not a task I am eager to reprise, although given some time, I might relent. The finished product turned out better than I deserved it to based on my skills. And Victoria loved it, which count more than anything. Here are a few photos of the finished quilt. 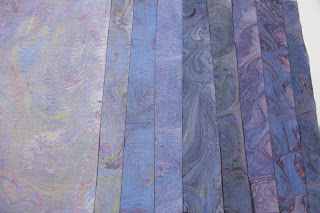 My next project for Christmas - marbleizing fabric for my mother, a creative, prolific, and talented quilter who has made over a hundred quilts in the last 20 years. I only recently learned how to marbleize anything, and this would be my first solo endeavor. My materials were quite old and not as sophisticated as the materials that my teacher provided, but I did my best. Aside: I took the class from Galen Berry, a fabulously talented artist from Oklahoma, at the Museum of Printing History in Houston, a unique venue that anyone who can visit should visit. The main deficiency, if it is one, of my marbled fabric is that the designs are quite light and not the visit hues that Galen's paint produced. But everything doesn't have to be vivid, so I made my mother 9 subtle, color-coordinated fat eighths (a quilting term meaning an eighth of a yard plus a bit - thus the "fat" part of the name.) I made each one increasingly darker, to give her the opportunity to create interest with her piecing. She really liked them, which delights me. When I get new paints, I'll make her a set of vivid fat eighths to make another quilt with ... because Mother is undoubtedly going to make another quilt as soon as this one is done! I feel good about these two accomplishments, although the time I spent making them kept me from doing other things, like blogging. I intend to catch up, but not all in one sitting, so watch for me to return with more tales of my holiday season. You are so brave to make a tee shirt quilt. My daughter wants one. We've been saving her tees for a very long time -- she's 25 now. LOL I don't have the courage to try making one myself--especially after reading your posts. The quilt you made looks wonderful and I have no doubt it will be special to your daughter--forever.